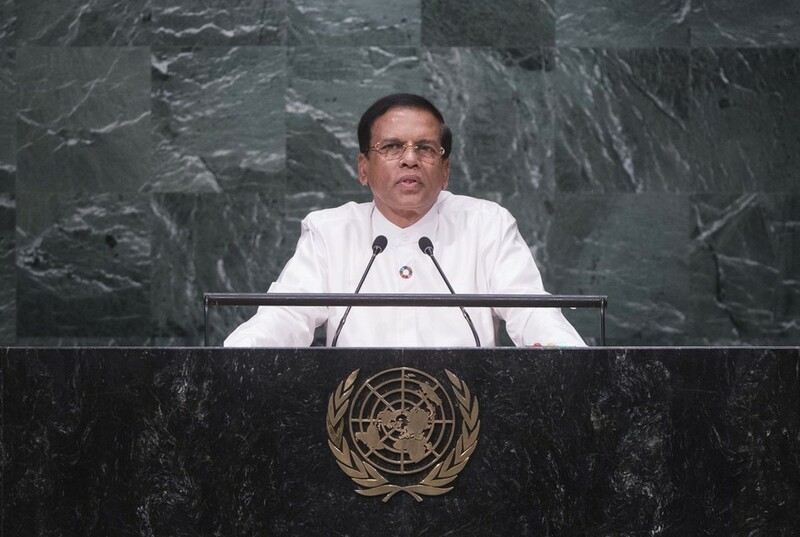 MAITHRIPALA SIRISENA, President of Sri Lanka, said that before he came to power the people of his country lived in fear. His main goal as President was to guarantee a free society for all of Sri Lanka’s people. “My intention is to make the people of Sri Lanka the happiest people on Earth,” he added, outlining various steps taken towards democracy and alleviating poverty. Sri Lanka was committed to taking the necessary steps to achieve sustainable development, including protecting its environment. It would also implement all development programmes and economic policies, new innovations and “green economy” policies. As an island, Sri Lanka planned to develop its fisheries industry based on solid research, he continued. It would also focus its development agenda on providing its people with health services, education and new technologies. He stressed the importance of having a society based on “good morals”. As a Buddhist country, Sri Lanka could tap into that knowledge and spirituality to solve its own issues, a process of which the wider world could take note. Sri Lanka had taken steps to strengthen rule of law and democracy as well as the necessary steps to prevent another war, as Sri Lanka had had “enough experience with a brutal war,” he said. Peace reconciliatory programmes had been established and he called for the international community to help Sri Lanka on its path of achieving long-term peace. There were “authentic visions” that applied to every single country in the world which should be taken into account when policies were implemented. “We move ahead with diligence, but I need your help to achieve this goal,” he said, urging international support. His goal was “to arm the new generation with knowledge and reconciliation”. Sri Lanka would carry out its security and development duties responsibly, but it needed assistance from the international community.